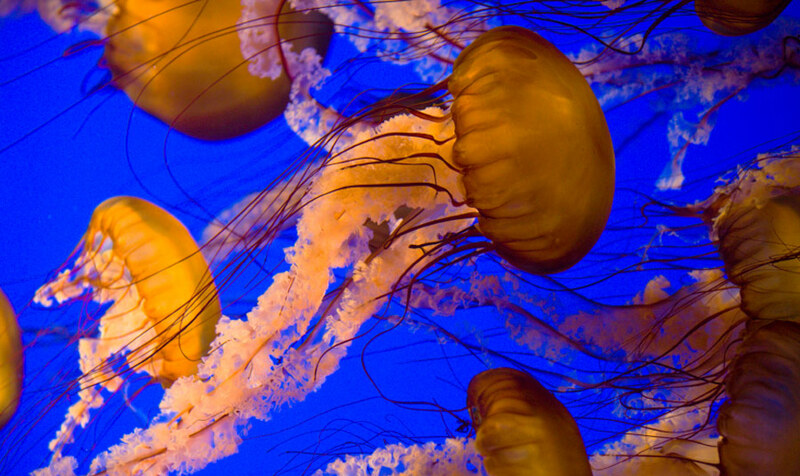 Looking to get the most out of your next visit to the Monterey Bay Aquarium? Not sure how long to spend there, where to eat or what to see? Read on for our best tips and tricks for an incredible visit. Get two days of admission for the price of one - This is one of the few discounts offered by the Aquarium and it’s a great perk! When you purchase your tickets through an Aquarium partner hotel, you are able to visit the Aquarium on two consecutive days at no extra cost. Scan the whole Aquarium on day one, then return on day two with a plan to spend more quality time at your most favorite exhibits. Each of the Inns of Monterey hotels offer individual tickets for sale or a Monterey Bay Aquarium hotel package. Jump the line – Aquarium Members and guests who purchase 2-day tickets from the Aquarium’s hotel partners are able to enter through the special Members entrance at Hovden Way. Get up close and personal with your favorite sea creatures – Long before the Aquarium opens to the public, visitors have the opportunity to join a behind the scenes tour that will allow you to learn more about sea otters, sharks or jelly fish. The ‘Feeding Frenzy’ Tour even allows you to help feed breakfast to the fishes and other marine creatures. If you are a fan of the furry sea otter, and really, who isn’t…. you should schedule a sea otter tour. Because this exhibit is so popular, a tour is the best way to experience this adorable creature. Involve the kids – The Aquarium’s website is chock full of fun educational resources like critter go fish cards, coloring pages, printable puzzles, and a DIY field guide. Print some of these items up in advance to give your kids things to do on the car ride or in the hotel if you are visiting from a distance. Find the best place to eat – Maybe looking at all of those fish makes your mouth water. There are several dining options in the Aquarium, but the best (and most expensive) is Cindy’s Waterfront serving fresh catch along with salads, sandwiches and a great wine selection. Use the complimentary binoculars set on the table to spy on passing sea otters, harbor seals, kayakers and boats. The Aquarium also has a casual café and coffee bar inside. Avoid the crowds – First thing in the morning and after 2:00PM are the best time of day to visit. Using the 2-day pass helps avoid burn out too. Fall and winter (excluding holiday periods) are also the slowest times. Coincidentally these are the best times to score a hotel deal at one of the Inns of Monterey hotels. Sleep with the fishes – You and your family have the opportunity to camp out in the aquarium and participate in activities throughout the evening after the general public has left. Talk about a unique and memorable family bonding experience! Talk to the people in the red coats – See all those smiling people in red jackets? They are volunteer docents who love the Aquarium just as much as you do. They dedicate their free time to helping to care for the animals and educate visitors. These folks just love to share all they have come to know and love about the aquarium and you certainly won’t regret striking up a conversation with one of them. Plan a memorable engagement – Reserve the Aquarium’s one of a kind Romance Tour and the helpful Aquarium staff will help you create a magical moment to propose to that special someone. Pet a decorator crab – Go ahead and (gently) touch decorator crabs, star fish, sea cucumber and bat rays in the various touch pools. The helpful docents will guide you and answer all of your questions. Stay nearby - It goes without saying, but we think the Inns of Monterey are the best hotel choices when visiting from afar. The Spindrift Inn, Victorian Inn and Monterey Bay Inn are all within easy walking distance and the Casa Munras Garden Hotel & Spa is just a five minute drive away.